Will Parramatta See Sydney's First High-Rise Schools? Parramatta's Arthur Phillip School is set to get a $100 million makeover, being rebuilt in a 17-storey tower to accommodate up to 2,000 students. The Daily Telegraph reported the plans, which also included a proposal for the neighbouring Parramatta Public to be built up to 15-storeys and accommodate an additional 1,000 students. Architecture firms Grimshaw and BVN won a competition to design the $100 million facilities, which drew entries from a number of renowned architects. 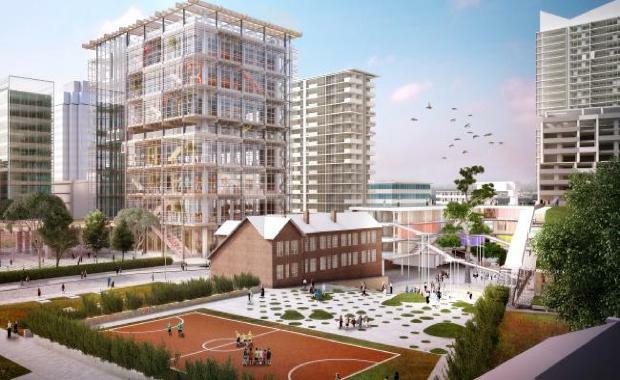 Grimshaw's Sydney managing partner and lead design architect, Andrew Cortese, told The Australian Financial Review that the new schools could increase their capacity for outdoor space. "Its a combination of having schools respond to population density and using existing assets much more. "You can have the same or more accessibility to outdoor learning spaces and much more purpose-designed learning spaces. "The high-rise schools are reportedly a response to the local region's increasing density, with more than 4,000 apartments set for North Parramatta over the next 10 years. According to the Daily Telegraph, school waiting lists in the area are growing out of hand, prompting the NSW State Government to re-imagine what schools will look like in the future. Both schools are scheduled to open in 2019.